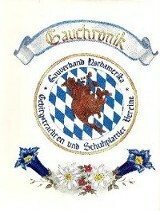 In 1993 the Gauverband honored its 25th anniversary by publishing a 376-page book entitled Gauverband Nordamerika Chronik. A 29-page history of the Gauverband itself chronicles how the organization was formed in 1966 when delegates from 18 Vereine met to draw up bylaws and agree on common goals. This section of the book has narratives of the milestones in the Gauverband's life: Gaufeste, Preisplatteln, and Delegates Meetings, new member Vereine, along with the Fahnenweihen of member Vereine. The evolution of the Gauverband is an interesting story. The majority of the book, two years in the making, comprises individual histories of 64 of the member Vereine (ranging from one to eight pages). Twenty of the Vereine were founded before World War II, the earliest in 1914. One Verein was cast as extras in several movies in the 1930s, including "Frankenstein." History of the Trachtenbewegung (native costume preservation movement) in Bavaria, which began in 1883. Description of the traditions we are upholding--Tracht, music, dance, art, and theater. The Chronik is available for purchase from Michael Rase, Gaubibliothekar, at bayerish@gmail.com.